One of my favorite pouch patterns is Butterick B5371, which is actually a collection of patterns, some of which are for belt pouches. I like these because they are lined and have a quasi-historical feel to them. The pattern on the right requires double sided fusible interfacing, but I've never been able to make that look good. So I usually opt for bias binding instead. This one, however, is my favorite. You can't quite see it, but the lacing is done through grommets, and I absolutely love grommets and eyelets. I have about a thousand of them in my notions box at home, and two separate attachment tools (one looks like a pair of pliers, the other is a simple rod setting that requires the grommet to be hammered in). I've also found that a nice touch is to add a patch or applique to the top flap. 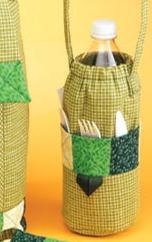 The image below is from Simplicity 5320, which is the pattern I used to make my most recent pouch. Since the recipient was male, I also cut out the shoulder strap, since I wanted to avoid a 'purse' look. Instead, I just made the drawstring cord longer so it could be easily tied to a belt. And of course, there is always the basic drawstring bag. I'll post a tutorial soon on my favorite way to sew a drawstring bag, since they are so versatile and easy to make. I'm also attending a costume event for which I'll need some 1920s attire, and I'll also make sure to post what I put together for that.